​In the WhatCar? Awards for 2016, the ŠKODA Superb has emerged victorious. Both versions of the vehicle have received recognition from WhatCar? 's judges. The estate version of the SUPERB​ with a 2.0-litre diesel engine claimed the award for models between £18,000 and £25,000. The SUPERB​ hatchback was named 'Best Compact Executive Car' under £25,000 when fitted with the same engine. An impressive number of category wins for ŠKODA at this year's awards prove the consistent, reliable practicality of the range. WhatCar? noted the Superb's smooth running over long distances. ŠKODA OCTAVIA Voted Best Family Car by WhatCar? The OCTAVIA Estate has been named as 'Best Family Car' in its price category for a third consecutive year. WhatCar? also decided that the CITIGO is the leading city car for under £10,000. In the '£18,000 or less' category for estate cars, the SKODA FABIA estate claimed the win. The FABIA hatchback is similarly the Best Small Car of the year. ŠKODA first launched the current generation of the SUPERB in September 2015. In little more than six months since release, it has racked up an enviable line of trophies. One of the most important awards for the car has been a full five-star Euro NCAP safety rating. The SUPERB has held this score since 2009, and an identical result following a retest in 2015 shows that ŠKODA still focuses on passenger protection. ISOFIX child seat attachments, seven airbags, Electronic Stability Control and Front Assist with automatic braking are all part of the standard equipment. Generous interior space, flexibility and efficiency helped the estate car to take the title. When the vehicle's rear seats are folded down, the boot space expands to 1,950 litres. The parcel shelf and LED luggage space lighting can be removed to maximise the area. According to WhatCar?, the SUPERB's interior has 'lots of neat practical touches'. An electromechanical parking brake keeps the car in place at a standstill, and access to infotainment is simple via the multi-function steering wheel. For the hatchback, the compliments continue. The SUPERB is actually one of the largest models in the category, just compact enough to meet the requirements. WhatCar? describes the boot in the Superb as 'cavernous', and praises the 'extraordinarily good leg room' and 'top-notch' ergonomics. The version evaluated each time was the SE Business trim level. This gives the estate and hatchback soft Alcantara-trimmed seat upholstery, a sat nav system, dual-zone climate control, and parking sensors. SKODA's 2.0-litre diesel engine is also offered with SE and SE L Executive models. It generates 148bhp, and is available with either a manual or dual-stage automatic gearbox. The SUPERB's efficiency was singled out for recognition by WhatCar?. As much as 68.9mpg combined from the engine can be achieved in both cars. Each model and equipment level arrives kitted out with an array of intelligent features. The latest technologies from the manufacturer have been packed into the cabin. These include a five-inch infotainment touchscreen and ŠKODA's Maxi-DOT trip computer. Both wins show the SUPERB's strong appeal as a company car. It is subject to attractively low rates of road tax and other business motoring charges. ŠKODA engines additionally cut down CO2 emissions while generating high fuel efficiency. On the outside, the Superb has the style and functionality to fit perfectly into a business vehicle fleet. 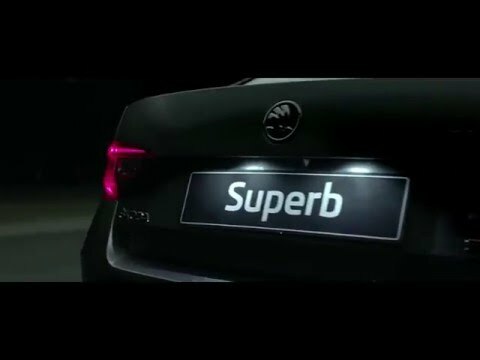 Find out exactly how and why the ŠKODA SUPERB lives up to its name. Contact Birchwood ŠKODA to book in for a test drive. Our ŠKODA showroom in Eastbourne also has the OCTAVIA, FABIA and CITIGO on display. You can also view our full range of quality used ŠKODA SUPERB for sale using our used car search.